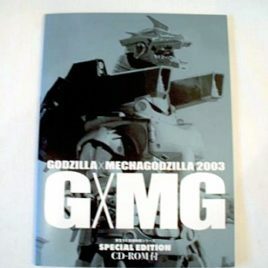 Made in 1988, this reissue of the original hard vinyl MechaGodzilla. Slightly shorter than the 1984 origiinal it stands approx. 7 1/2 inches tall. Articulated. Near mint to excellent condition with minor scuffing on the silver. Without tag. 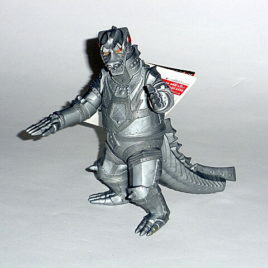 Made in 1984, this original hard vinyl MechaGodzilla is a difficult figure to find. Slightly taller than the 1988 reissue it stands approx. 8 inches tall and tail end is different than the re-issue. Excellent condition. NO TAG. 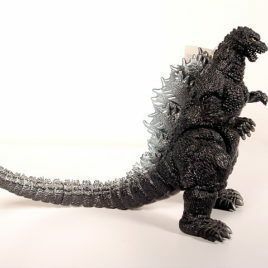 Mechgodzilla in Striking BLACK & SILVER with gold eyes stands approximately 9 inches tall and 11 inches long. This is one of the more breathtaking theater figures in our opinion. 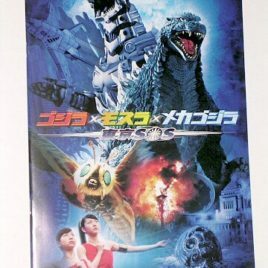 It is a theater exclusive figure which means that it was only available at some of the movie theaters in Japan during the showing of GODZILLA MOTHRA MECHAGODZILLA Tokyo SOS He comes with Super weapons shoulder pack and is poseable with articulated waist, head, tail and arms. .
TERROR OF MECHAGODZILLA ORIGINAL RELEASE ONE SHEET. Approx. 20 1/2 by 28 1/2 inches. 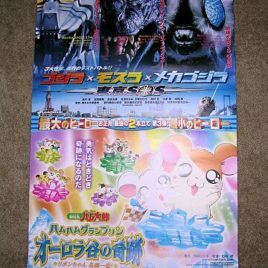 We LOVE this poster! It is one of our favorites. 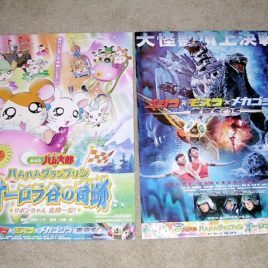 SOOOOOO MUCH ACTION! MINT CONDITION. 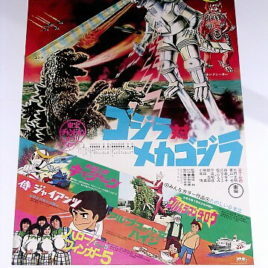 GODZILLA VS MECHAGODZILLA 1974 ORIGINAL RELEASE ONE SHEET. Approx. 20 1/2 by 28 1/2 inches. EXCELLENT CONDITION (HAD BEEN FOLDED IN THE MIDDLE. 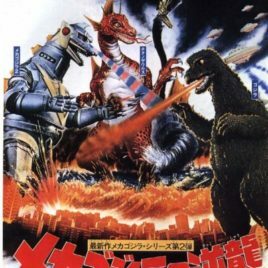 Here is the 1974 Style Mecha Godzilla as featured in the Toho Movie Godzilla vs Mechagodzilla 1974. 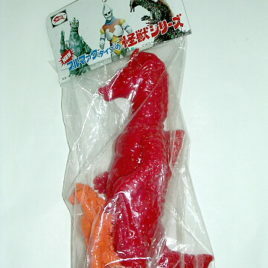 This is the Bandai 1988 re-issue of the figure. 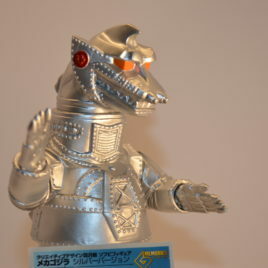 Bandai originally produced a 1974 Mechagodzilla in 1983. The 1988 re-issue has the 1983 copyright on its foot however this is the 1988 re-issue. The best way to tell if there is not a tag is to compare with the 1983. The 1988 is smaller because when the 1983 mold was used some size was lost. Also the BEST way is to look at the end of the tail. The 1988 version has a small ball like circular end. This figure is in NEAR MINT condition. It has very minimal wear. It does not have its tag. 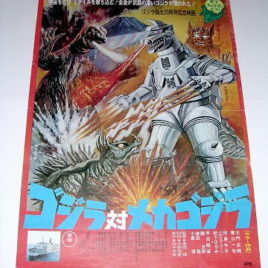 Here is the 1974 Style MechaGodzilla as featured in the Toho Movie Godzilla vs Mechagodzilla 1974. 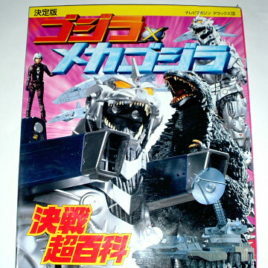 This is the Bandai 1988 re-issue of the figure. 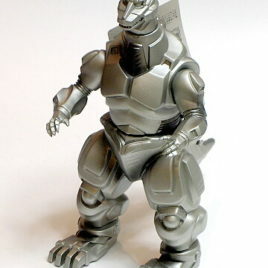 Bandai originally produced a 1974 Mechagodzilla in 1983. The 1988 re-issue has the 1983 copyright on its foot however this is the 1988 re-issue. The best way to tell if there is not a tag is to compare with the 1983. 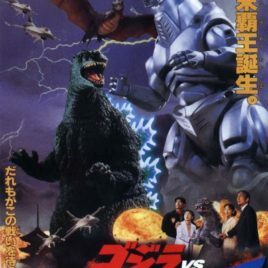 The 1988 is smaller because when the 1983 mold was used some size was lost. 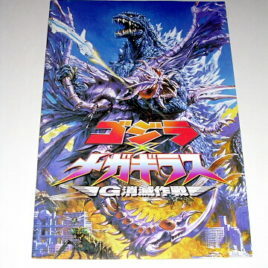 Also the end of the tail has a ball like circular end which is different from the 1983 version. This figure is in EXCELLENT condition. It has some slight wear and paint rubbing, with a few minor small scratches. It does not have its tag. The MG 1975 is OUT of PRODUCTION and VERY, VERY Hard to Find! These are highly detailed vinyl figures for collectors of all ages and great for kids to play with!! They are made of thick flexible vinyl and can stand up to rough play. 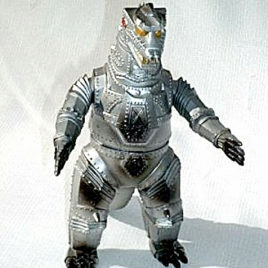 MechaGodzilla 1975 stands approximately 6 inches tall and is articulated at the arms, legs, waist and neck. 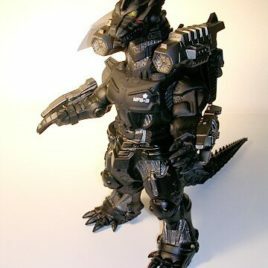 THIS MECHAGODZILLA SCULPT CAPTURES THE "SUIT" complete with its bends and dents. 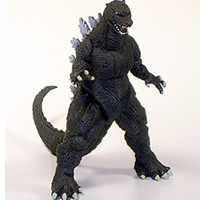 Check it out, this is not a sculpt of the monster, this is a sculpt of the MONSTER SUIT! Comes Mint Condition with 2002 "folded type" Tag. Tag is Near Mint to Excellent. Scroll down to see additional photos. The MG 1975 is OUT of PRODUCTION and VERY, VERY Hard to Find! 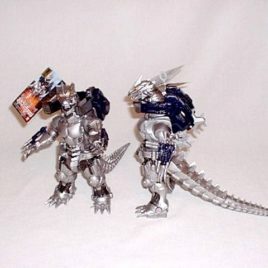 These are highly detailed vinyl figures for collectors of all ages and great for kids to play with!! They are made of thick flexible vinyl and can stand up to rough play. 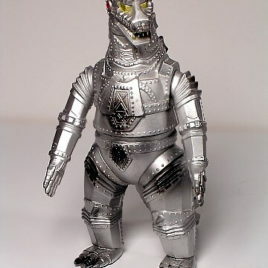 MechaGodzilla 1975 stands approximately 6 inches tall and is articulated at the arms, legs, waist and neck. 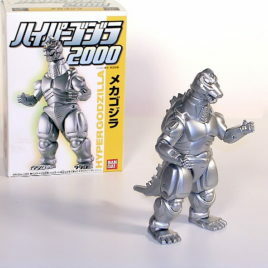 THIS MECHAGODZILLA SCULPT CAPTURES THE "SUIT" complete with its bends and dents. Check it out, this is not a sculpt of the monster, this is a sculpt of the MONSTER SUIT! Comes Mint Condition with near mint tag. 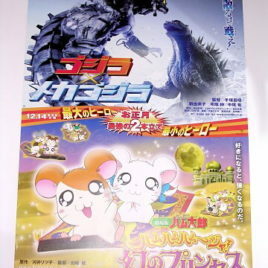 Produced by Run-A Company Japan in 2008; these CUTE cell phone straps or back pack mascots make GREAT Gifts! 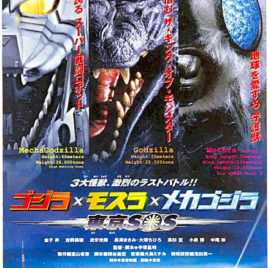 This one is a Kewpie doll in a MechaGodzilla suit. The figure stands approximately 2 inches tall. The strap is approximately 6 inches long. It comes MINT in colorful cellophane packaging. Scroll down for additional photo.